When Jake was about 7 months old I made an SSC from this free pattern I found online. 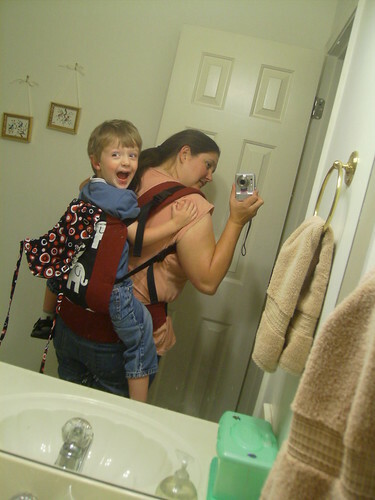 It was nice and served its purpose, but when he started walking the carrying idea was SO OUT. So I gave it to a friend who had a little one. I knew I’d want to make another for the next child since although I liked it, I wished I had chosen different fabric and there were a couple of fussy bits that I wanted to correct. After Erik was born I was all set to use that pattern again, but then I came across the Sweetpod pattern on Etsy. There were a few things about this pattern that really appealed to me – the internal panel making back carries easier and the invisible sleeping hood pocket. I waffled between buying this pattern or just using the free one again for a long time, but decided to give the Sweetpod a try. Sweetpod SSC. Isn't this the best picture ever? Erik was asleep, so Jake helped model it. I’m glad I did. The pattern made up very nicely. It isn’t so complicated that you need prior SSC sewing experience to grasp and I’m a testament that any old sewing machine can handle the job. (My machine is a plastic bodied, $80 model Singer that I love to pieces but gets me laughed at when I take it in for service.) For the most part, this pattern is excellent, but I did have a couple of issues with it. The hardest part of the pattern is attaching the sleeping hood and hood pocket to the main body panel. I wish there had been a diagram for this step, since even though the wording is about as clear as you could get it, it obviously wasn’t clear enough for me. I ended up attaching the hood to the wrong side of the zipper. I realized the mistake before I attached the other side of the pocket, but it still meant quality time spent with the seam ripper. A diagram showing you exactly what she meant by the “top part of the zipper” would have been very helpful. When I originally read it, I thought she just mean the top side of the zipper tape, but in fact she’s talking about the part above the teeth. Once you get it, it’s obvious which is probably why there isn’t a diagram for it. For a pattern this involved, I consider this issue to be really minor. I had one other sewing issue that was completely my fault. I cut the hood strings on folded fabric, so I ended up with two pieces 20″ long. I failed to cut either of them in half, so my hood strings are ridiculously long. The placement of the snaps creates a hood that would only be suitable if your child has a head the size of a 40 pound pumpkin. Even my 3 year old’s head can roll around in the hood like a marble in a beach ball. Since I’d like a little more support for my 4 month old, I’m going to fix the straps. This will put the snaps in a position to actually support Erik’s little noggin. It means more quality time with the seam ripper, but that’s okay. I’m also having a hardware issue, but it’s no fault of the pattern. I ordered my hardware from Outdoor Wilderness Fabrics and the buckles aren’t holding their position on the straps. OWF is one of the two places she mentions being able to buy supplies for the SSC. Seattle Fabrics is the other. My personal favorite is Strapworks.com however they don’t have the ladder locks. I wish now I had gone with them and then bought the ladder locks from Seattle Fabrics. In any case, I plan on calling OWF to see if there’s any remedy for the buckle slippage. For the moment I’ve tacked them into place with a line of stitching, but that won’t work as Erik gets bigger. Working with a three year old underfoot and a 4 month old needing attention I was able to complete the carrier in four days. If you don’t have such distractions you could sew it up in a day. 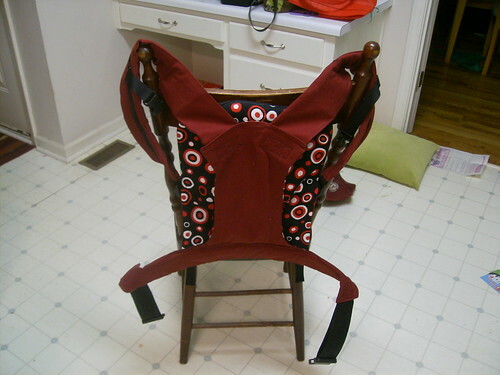 The pattern creator offers a certified seamstress program with a totally reasonable fee. If I were able to sew these faster than the average land speed of a 3 toed sloth I would consider it. If you’re looking for a custom carrier without the custom price tag and you’re an intermediate sewer, the Sweetpod pattern is well worth the money. There’s a flickr group dedicated to the pattern which is fun to look through. I used the Elle fabric from Premiere Prints (bought from fabric.com), duck cloth and a quilters cotton from JoAnn’s. ETA: Went to the park with it this morning and the buckles behaved much better. The waist buckle is still not holding it’s position, but since it’s sewn I’m okay with that. 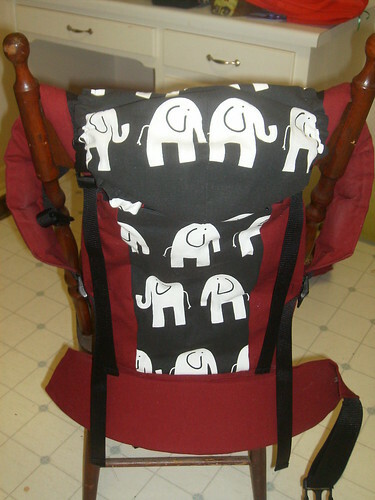 I love the elephants fabric you used, and I give you mad props for managing that, I totally lack all and any sorts of sewing skills! Beautiful carrier, what a great job you did! 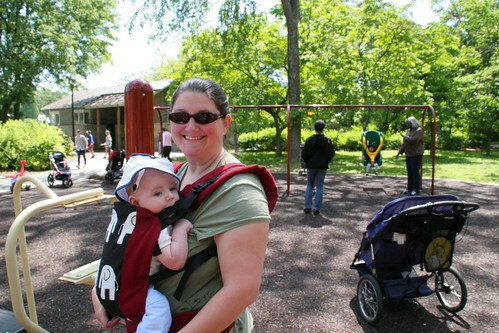 I love babywearing but as my kiddos are 4 and 20 months neither wants to be worn anymore 🙂 I wish, wish my 20 month old son would let me wear him sometimes when we’re out and about, but just like your oldest, ever since the walking set in he just wants to go on his own! Just curious… Where did you get your foam? 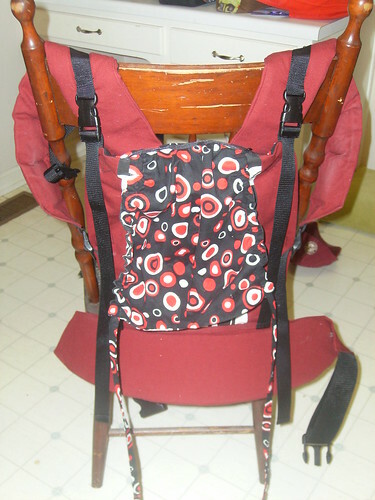 The padding in the shoulder straps was just some scrap fleece I had on hand. i have an ergo and I love it. 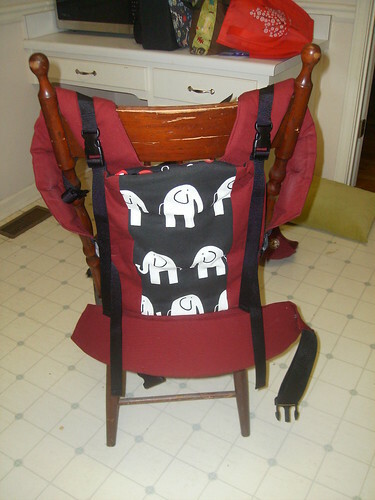 When I saw this pattern I was really excited because of the similarity are also the inside panel useful for the back carrying position. Yours turned out really cute. My question for you is how much did it cost you in materials and hardware total?? 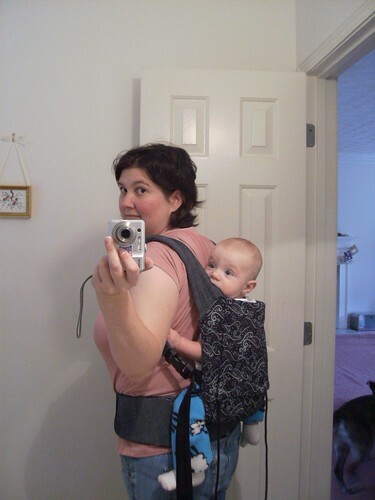 Also as your baby gets older do you feel like you wished it had more head support for a larger baby who wants to rest? Hi Lara! I actually wrote and made this carrier way back in 2011. I honestly don’t remember how much all the materials and hardware cost in total, but I think it was less than $50. The sleeping hood ended up perfect for my chunky monkey, and I used it right up until he started to walk (an no longer wanted to be carried). Before that, he always wanted to be with me, so I used it a LOT. Most days he spent the majority of time asleep on my back, with no issues. The sleeping hood is actually fairly adjustable, so if you want it tighter or looser it isn’t a big issue to change it. Hope that helped!